Moto Guzzi V85TT production bike revealed. 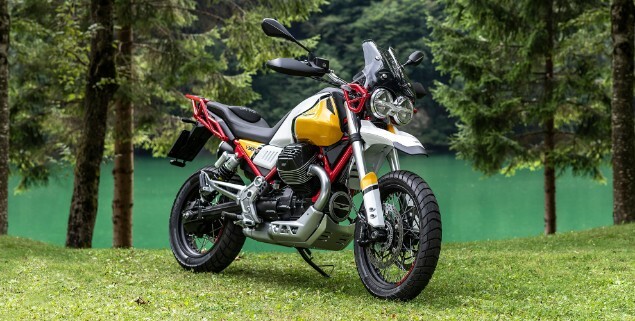 Famous Italian brand Moto Guzzi has revealed the full production version of the V85TT adventure bike a month before the official unveiling of the bike at the Milan motorcycle show. The first ‘prototype’ version of the bike was shown at the Milan show in 2017 and now, almost a full year later, the bike that will be on sale imminently has been shown. Changes to the prototype machine are not that massive. The red-painted trellis frame remains the same as the original bike but there are some changes around the headstock area. Making sure the bike can pass emissions and noise regulations has meant the routing of the exhaust is longer in order to fit in a catalyst and silencing material. The colour screen appears to offer a lot of opportunity for information to be shown to the rider, and that would also seem to include the option of different riding modes. Looking at the icons that are visible on the top-right of the screen, it would seem the option to have a rider to pillion communication system as well as linking a smartphone to the bike might also be an option. 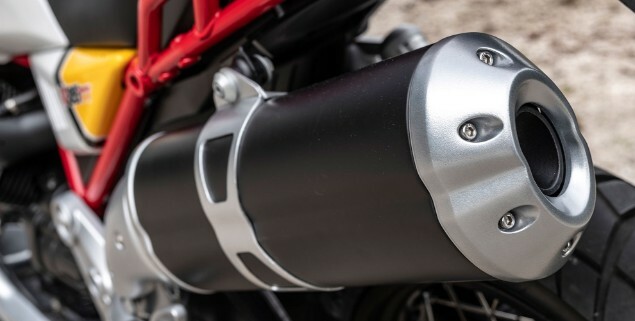 Underneath the V85TT is an existing 853cc, 90-degree transverse V-twin which will produce around 80bhp, which will put the bike at the lower end of the power table in the mid-size adventure bike market but still on a par with the likes of the BMW F750GS but lower than the 95bhp of the Triumph Tiger 800 range. Prices and availability will be released at the Milan motorcycle show which runs from 6th to 11th November.